This entry was posted in Recitals on 20/02/2017 by David. 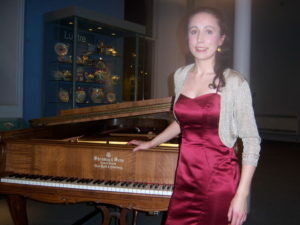 Valentine’s Day was celebrated in style at Sunderland Museum when the Pianoforte Society presented a recital by brilliant young British pianist Maria Marchant, who entertained an appreciative audience with an evening of romantic music. The recital started with a selection of well loved lyric pieces by Grieg to be followed by Liszt transcriptions of Schubert songs. Then we heard the Liszt Petrarch sonnet 104 from “Deuxième Année: Italie”. The first half ended with Spanish music; we had Granados “The Maiden and the Nightingale” and Albeniz “Sevilla”. After the interval Glinka’s “L’Alouette” was followed by pieces from Prokofiev’s “Romeo and Juliet”. We then heard Debussy’s “La Cathédrale Engloutie” and Brahms’ Intermezzo Op. 117 No.1. The recital ended with Beethoven’s Moonlight Sonata which was played with great style and authority, but the audience was wanting more and Maria played Holst’s “Northumbrian Pipes” which made for a very good end to the evening. Maria made her Wigmore Hall and South Bank debut in 2010 and has since been in great demand throughout Britain and abroad. 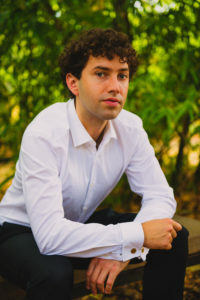 As a passionate advocate of British music, Maria gave the world premiere performance of “Goodwood by the Sea”, a new solo piano work by Roderick Williams written for Maria and commissioned by the Shipley Arts Festival, where she is pianist in residence. Maria is also involved with chamber music and is recording her debut CD for SOMM records for international release in 2017. This entry was posted in Recitals, Reviews on 15/02/2017 by David.